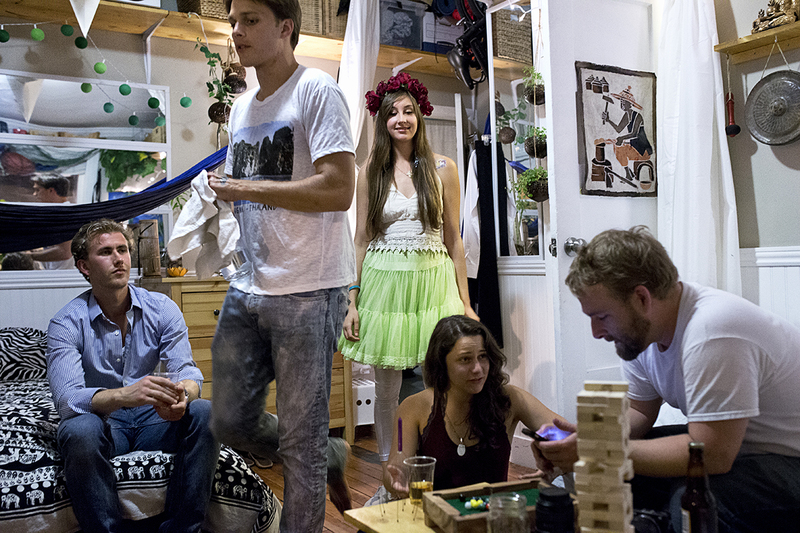 Emily Erickson (center) and her boyfriend Sean Ahrens (second from left) host guests in their room at 20 Mission, a co-living space, during a party to celebrate the community’s three-year anniversary in San Francisco, Calif., on Saturday, March 28, 2015. Around 40 people live in the building, which is a former single room occupancy hotel that had been vacant for several years before being turned into the co-living space. Ahrens and many of the other residents are start-up entrepreneurs and the community is a mix of temporary occupants and people who have made the space their home on a more long-term basis.